The Honor Play mobile was launched in August 2018. 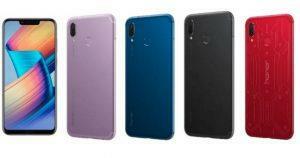 The Honor Play support for 2G, 3G and 4G networks and has two nano-type sim + memory card up to 256GB. Weight 176 grams with strong metal design with a thickness of only 7.5 mm. A large screen 6.3 inches IPS LCD and the screen Notch at the top with the front camera, the screen FHD + and 19.5: 9 with the acquisition of 83% of the screen of the body of the phone, which shows very few edges of the screen and the density of pixels about 409 pixels per inch. The Notch feature is hidden from the phone settings. The presence of notch in the screen makes only two icons appear on the notch and to see the rest of the notifications need to pull the top menu. It comes with Android Oreo 8.1 with EMUI 8.2 interface. The mobile comes with the best processor from Huawei, the Kirin 970 has excellent performance and fast and also supports the graphics processor Mali-G72 MP12 and you will undoubtedly get a very impressive performance experience in games with this powerful processor and the same processor is available on the phone Honor 10, the performance of the ideal. The Honor Play Mobile supports GPU Turbo for 60% better performance in graphics processing with greater power. 64GB/128GB storage space with 4GB/6GB RAM. Dual rear camera 16 + 2 megapixel camera with narrow lens f / 2.2 with LED flash and of course supporting insulation by secondary camera The performance of the camera will be good in high-light and sunlight, but will be reduced in a few lights due to the narrowness of the aperture The camera also supports video recording quality 2160p @ 30fps and supports electronic installation in video imaging, but by reducing the quality of the camera supports 1080p AI to learn stuff to pick you better position shooting full of colors and saturated. The 16-megapixel camera is the same as the P20 Lite, which has a superior performance in silhouette photography and supports the portrait camera via the software. It can also shoot HD video but does not support artificial intelligence. There is a 3.5mm headphone jack. The Honor Play mobile phone supports a LED notification light inside the handset that lights up the arrival of a phone notification such as a Facebook or Facebook message. Supports fingerprint on the back of the phone. The Connectivity options include Accelerometer, Proximity sensor , light sensor , fingerprint recognition , gyroscope and OTG function. A 3750 mAh battery supports fast charging through the USB Type C port and the quick charger comes with the phone and the battery is fully charged in an hour and a half and the battery holds up to 7 hours on screen almost indicating the power of the battery. Mobile comes in colors: black - blue - pink - red. The Honor Play is a very cost-effective product. Made by Honor, the manufacturing process is excellent to ensure the quality and service life. The design is simple and stylish, and the most attractive is the price of the value for money. In general, it is a cost-effective option. The best processor from Huawei performs an excellent close-up performance for the Snapdragon 845 knowing that the price of the phone is in the middle class. The Honor Play screen is large with a few edges and can be hidden from the phone settings. Huge battery supports fast charging via USB Type C.
Supports fingerprint + Face Unlock. The MEMORY card is mounted to the second slide. There is no protection layer on the screen. The headphones are not stereo and it would have been better to have a stereo to get a great gaming experience. Main card: LTE FDD: B1/B3/B5/B8; TD-LTE: B34/B38/B39/B40/B41; WCDMA: B1/B5/B8; TD-SCDMA: B34/B39; CDMA (primary and secondary card two Option 1): BC0 (800MHz); (China Telecom (China + Macao) only); GSM: B2/B3/B5/B8 (850/900/1800/1900 MHz); Secondary Card: LTE FDD: B1/ B3/B5/B8; TD-LTE: B34/B38/B39/B40/B41; WCDMA: B1/B5/B8; CDMA (primary and secondary cards): BC0 (800MHz); (China Telecom only (China) Continental + Macau)); GSM: B2/B3/B5/B8 (850/900/1800/1900 MHz); Note: The network and frequency bands may vary from region to region depending on the local operator and your location .